Through its long-range planning activities, the Planning/Community Development Department assists the City Council with the development and implementation of long-term goals and policies that guide the physical, economic, and social development of the City. The City of Cloverdale General Plan envisions the future of the City over a 20-year time frame. The Plan sets forth goals and policies necessary to achieve this desired future, describes how the community will be laid out, as well as the kind of services it should receive. It also sets forth the mix of residential, commercial, and public uses the community would like to have. 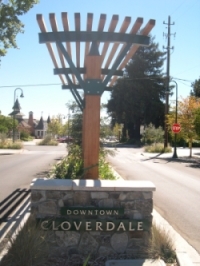 Many of Cloverdale's current activities are focused on achieving the vision described in the General Plan, with much of the funding coming from Cloverdale's Redevelopment Agency. In an effort to manage growth and protect the small town character of the City, the people of Cloverdale adopted an Urban Growth Boundary in November, 2010. The Urban Growth Boundary seeks to manage growth by prohibiting urban development and the provision of city services outside its boundary. The Station Area/Downtown Plan acts as a guide for integrating the City and passenger rail service to the Cloverdale Depot. The plan places particular emphasis on pedestrian-friendly connections to the Depot, opportunity development sites at Citrus Fair Drive and Cloverdale Boulevard, and the Cloverdale Downtown. The Alexander Valley Resort Specific Plan implements the City’s General Plan by setting forth land use regulations and design standards for approximately 254 acres fronting on Asti Road in the southeast area of the City. The Plan includes a mixed-use destination resort and residential community with supporting commercial and public facilities.